The Oklahoma Sooners already had a stellar 2019 recruiting class. 247Sports ranked OU's class No. 16 in the country, which is Lon Kruger's highest-rated recruiting class since he arrived at Oklahoma and the Sooners' top-ranked class in a decade. The class features two players ranked in the top 100 and a junior college All-American. But on Wednesday morning in Australia, this lauded recruiting class got a little bit better – and a lot more interesting. The clock in Canberra, Australia is 14 hours ahead of the clock in Norman, Oklahoma, meaning Anyang Garang, a skilled 6-foot-9 wing with a wingspan that is purportedly 7-5, was able to sign his National Letter of Intent when it was still afternoon at the Lloyd Noble Center on Tuesday – a few hours before the American calendar turned to National Signing Day. And while Australian players coming to American college basketball is not exactly a new phenomenon – Randy Bennett and the Saint Mary's Gaels have practically shaped their program around Aussies, having brought 18 Australian players to their school, including future NBA players Matthew Dellavedova and Patty Mills – Garang marks a captivating storyline that might pave the path for future players like him. Garang's path to Oklahoma began when his family, originally from South Sudan, settled in Uganda. When Garang was a young boy around 5 years old, Uganda was experiencing a civil war, and his family fled to Australia, which has a substantial South Sudanese population. His mother was out of the picture, and when Garang's father passed away several years ago from an illness, his aunt and uncle became his legal guardians. They lived in a house in Adelaide on Australia's southern coast with a dozen family members. He played Australian rules football and soccer and then, at age 13, picked up basketball. "It wasn't my first preference of sports," Garang told CBSSports.com. "I was uncoordinated, still growing as a kid, and I didn't know what sport I liked." But friends in Australia's substantial South Sudanese community encouraged him to play the sport. "Sports is a big thing for the community to get together," he said. "It gives you something to do as hobby, something to focus on, a way to stay out of trouble." He was naturally talented: A body that, as he grew, became increasingly like that NBA-like body, a sweet shot, and excellent athleticism. He played within the South Sudanese community, and he was soon recognized as a potential big-time talent, and started playing for a regional team that went to the national championship. There, Marty Clarke, the head of the NBA Global Academy in Canberra, saw him. 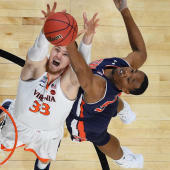 "He can do some things and cover more space than a lot other kids," Clarke, who was the associate head coach under Bennett at Saint Mary's, told CBSSports.com. "It looked like he played hard and would be coachable. His demeanor was composed, and he was comfortable in himself. In young men that's not always the case. They try to be someone they're not. Anyang, he just went and played." A couple of years ago, he was offered a scholarship to play at the NBA Global Academy in Canberra, Australia. The NBA has over the past three years opened seven live-in basketball academies around the world: Three in China, one in Mexico City, one outside of New Delhi, India, one in Senegal and this one in Canberra. The NBA Global Academy in Australia is the NBA's hub for the top male and female prospects from outside the United States. With his commitment to Oklahoma, Garang become the fifth graduate of the Australia academy to play basketball for a Division I school, and the 11th graduate of the NBA Academy system to commit to a Division I school. "He is a story of how the system should work – it can gather kids at a whole bunch of different entry points," Clarke said. "He got seen, and he's been given an opportunity." In his two years at the NBA Academy, Garang's confidence shot up. Carlin Hartman, an assistant coach at Oklahoma, read about him in one of the recruiting services the school subscribes to. Kevin Kruger, son of Oklahoma coach Lon Kruger, went to see Garang at an international basketball showcase in Las Vegas in December. Garang made an official visit to campus, and the match felt right. Kevin Kruger saw a young man who was engaging and respectful and genuine – someone who could be a good teammate and a hard worker. The coaching staff is talking with Garang about redshirting him for a year so he can work on skill development and adding muscle. "He's got versatility, he's rangy, he's athletic," Lon Kruger said. "He's going to become a really good shooter, he plays in the open court, and he's got good length. He has a really high upside. He just needs time and strength." Hartman is also excited about Garang's prospects. "The ceiling, because of his body type, is ideally what the NBA looks for," Hartman said. "But there's so many steps between now and when he could reach that ceiling. He's shown he's willing to put time in and he's willing to work, willing to get extra workouts in." One of the things the NBA sees in Garang is this: He's proof that their new international academy system works. Garang got to the academy in Australia and improved exponentially. "It's like a hothouse," Clarke said. "You put plants in a hothouse and they grow very quickly."